LACK OF DREDGING OF THE MISSISSIPPI RIVER NEGATIVELY AFFECTS PORTS AND INDUSTRIES ON THE WATERWAY: As project seven on Trump's list, it is catalogued at a cost of $1 billion that would create 200 direct jobs. Trump released 50 emergency infrastructure projects, totaling $317.5 billion in investment. Trump's list appears to be a first stage in the president's $1-trillion infrastructure program. Executive director of the Port of South Louisiana lobbied Trump’s transition team for Mississippi dredging. $317.5 billion in investment and supporting the creation of over 193,000 jobs. The list includes three Louisiana projects, one of which is the dredging of the Mississippi River. The list appears to be a first stage in the president’s infrastructure program, through which he pledged to spend $1 trillion over ten year rebuilding roads, bridges, tunnel, ports, and other infrastructure. Projects on the list had to be deemed a national security or public safety emergency, shovel ready, with at least 30 percent of initial design and engineering work complete, a direct job creator, and a project with the potential for increased U.S. manufacturing. The appearance of the Mississippi River project on the list may have been due to lobbying by Paul Aucoin, executive director of the Port of South Louisiana. Aucoin traveled to Washington, D.C. last month and met with Dan Slane, then a member of Trump’s transition team, and today serving in the White House as deputy director for infrastructure at the National Trade Council. In Aucoin’s meeting with Slane, the two discussed issues affecting the Port of South Louisiana, including the dredging of the Mississippi River. “I stressed that ensuring the river is open for business will stimulate impressive economic growth and generate thousands of good paying jobs for working Americans,” said Aucoin. States other than Louisiana are also dependent on the mouth of the river being properly dredged, according to Aucoin. He also claims the project is a matter of national security. Although Congress authorized a 50-foot channel depth in 1985, the project was never properly funded. A plan released by the US Army Corps of Engineers in December showed the deepening project would have an initial cost of $88.9 million, while maintenance and operations will cost about $21.6 million a year. The annual benefit to the U.S. economy would be $96.8 million, according to the Corps’ report and the project would take four years to complete. 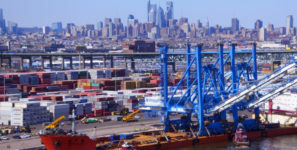 While ports on the east coast have been adequately deepened to 50 feet to accommodate today’s deep-draft vessels, the lack of attention to the Mississippi River channel continues to negatively affect ports and the industries that lie upon the largest waterway in the nation. Aucoin is pleased that Trump is prioritizing this project. As project seven on Trump’s list, it is catalogued at a cost of $1 billion that would create 200 direct jobs.